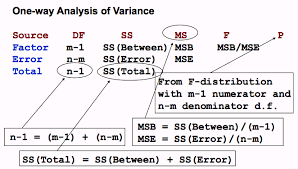 So today, I will tell you about ANOVA(ANalysis Of VAriance ). ANOVA: is a parametric method appropriate for comparing the means for 2 or more independent or dependent groups. One Way ANOVA: The one–way ANalysis Of VAriance (ANOVA) is used to determine whether there are any significant differences between the means of two or more independent (unrelated) groups (although you tend to only see it used when there are a minimum of three, rather than two groups). Repeated-Measures ANOVA: Repeated measures ANOVA is the equivalent of the one-way ANOVA, but for related, (not independent) groups, and Repeated-Measure is the extension of the dependent t-test(learn about dependent t-test by clicking on the given link). Factorial ANOVA: More than one Categorical Independent Variables. Factorial ANOVA measures whether a combination of independent variables predict the value of a dependent variable. The term “way” is often used to describe the number of independent variables measured by an ANOVA test. In this article I will do One Way ANOVA by hand, but in next article I will teach you how to perform ANOVA in R.
Critical significance value α(alpha) = 0.05. H(0)[Null Hypothesis] = μ1 = μ2 = μ3. H(α) = At least one different among the means. 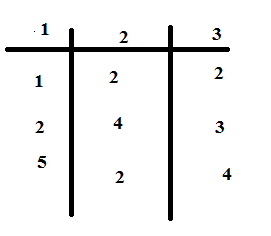 STEP 2: Calculate the mean for each condition for group. Now we have find F and F(critical) value compare these value whether we can reject our null hypothesis or not. H(0)[Null Hypothesis] = μ1 = μ2 = μ3. Their is no significant difference between the 3 groups of our table. If you have any doubts please mention in comment box or reach me @ irrfankhann29@gmail.com. Care to share a use case senario? Would it be aplicable for comparing the classroom averages by subject for middle school?